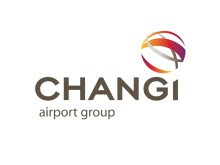 SINGAPORE, 11 November 2018 – Changi Airport’s new T1 carpark, situated within Jewel Changi Airport (Jewel), will open on 20 November 2018. The carpark is part of the ongoing T1 expansion works, which commenced in March 2015 in conjunction with the Jewel development. 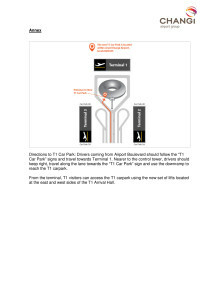 The T1 carpark will have five underground levels from B2M to B5, with a total of 2,500 parking spaces. About half the parking spaces will be open for use from 20 November 2018, with the remaining spaces made available progressively before Jewel opens in 2019. A map showing the new facility and directions to the car park can be found in the Annex. The 440 parking spaces on the top two levels (B2M and B2) will be reserved for short-term parking. The charge for parking at this zone will be 4 cents per minute for the first 90 minutes and $5 per 30-minute block thereafter. The parking charge at levels B3 to B5 will be the same as that for other car parks at Changi Airport, i.e. 4 cents per minute. With the application of tiered charging at levels B2M and B2, drivers will be able to find available parking spaces easily given the quicker turnaround of spaces in this dedicated zone. 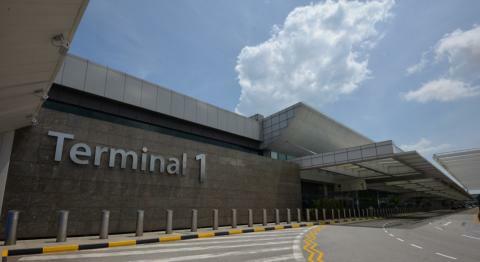 Drivers and visitors who anticipate a longer stay should park at levels B3 to B5, where 700 spaces will also be available from 20 November and another 1,360 spaces by the time Jewel Changi Airport opens. The opening of the new parking facility will see the current T1 and T2 car park being renamed as Car Park 2B and Car Park 2A respectively.